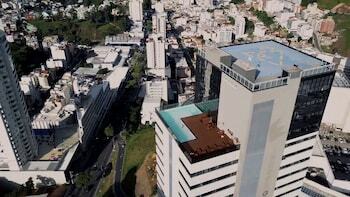 With a stay at Trade Hotel in Juiz de Fora (Cascatinha), you'll be within a 10-minute drive of Lajinha Park and Natural History Academic Museum. Featured amenities include a business center, dry cleaning/laundry services, and a 24-hour front desk. Event facilities at this hotel consist of a conference center and meeting rooms. Free self parking is available onsite. With a stay at Ilive 018 - 2 Bedroom Copacabana in Rio de Janeiro (Copacabana), you'll be within a 10-minute drive of Sugar Loaf Mountain and Avenida Atlantica. With a stay at Vila Guaiamú in Morro de Sao Paulo, you'll be by the sea, just a 4-minute walk from Third Beach and 8 minutes by foot from Fourth Beach. With a stay at this apartment in Canela, you'll be convenient to Cathedral of Our Lady of Lourdes and Joao Correa Square. Free self parking is available onsite.